(TibetanReview.net, Jan26, 2018) – With the appointment of a total of nearly 200 Communist Party cadres, required to be committed atheists, in top finance, security and admission roles, the Communist Party of China has effected a complete takeover of the Larung Gar Buddhist Academy, one of the world’s top centres for the study and practice of Tibetan Buddhism, located in Serta (Chinese: Seda) County of Sichuan Province. The Chinese government is splitting the centre into two sections, an academy and a monastery, divided by a wall, said New York-based Human Rights Watch (HRW) in a new report Jan 24, citing an English-language translation of a document whose Chinese original the group said it had received in Aug 2017. 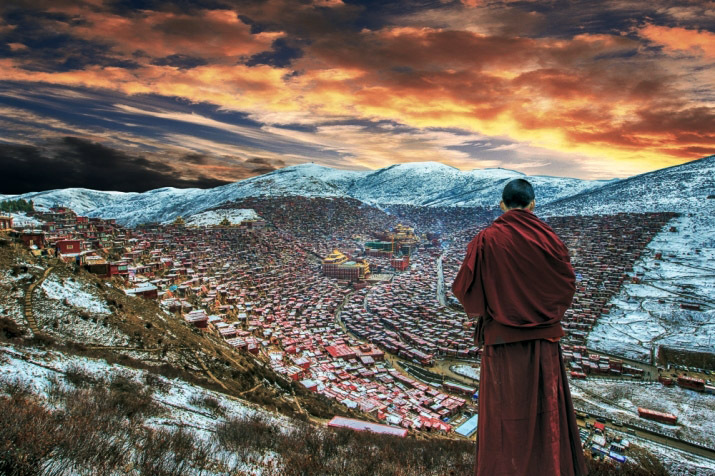 Larung Gar, a sprawling Buddhist centre, already stands reduced in size through an eight-month programme of demolition of residences and expulsion of monks and nuns carried out by the Chinese government till Apr 2017. New measures for administering both the academic centre and the monastery are stated to include setting of quotas for recruitment, a management system of “real-name registration” and tags for monks and nuns. A large building is said to have been constructed to house the cadres in each section. The aim is not just to reduce numbers at the settlement, for “Chinese authorities are also imposing pervasive control and surveillance over every level of activity within religious communities,” Sophie Richardson, US- based China director for HRW, has said. The changes at Larung Gar are in line with China’s current religious policy, which emphasizes ensuring political stability in monasteries by intensifying official management. It involves rewarding political compliance by monks and nuns with public praise, titles such as “model patriotic monk,” and other material or social benefits. HRW said the document aimed at making the study of Buddhism “standardized, law-abiding and modern,” a reference to a new, centralized system for managing religious training, textbooks, and curricular content maintained mainly through a network of higher studies institutes being constructed throughout China to retrain Buddhist monks.